Jason and I don't have green thumbs. We've got an oak tree in our front yard that the builder planted. Everyone else's is now twice as tall as ours. My poor gardenia tree never flowers. I could go on. So here's an effort at some spring flowery-ness. I was able to finish this lap quilt over the weekend. Truth be told, I finished quilting it and sewing the binding on at 1:00 AM Saturday morning, 5 hours before we had to leave, but I wanted something to do while the kids played and, to me, binding a quilt is good busy work (and daylight is easier on my eyes than room light is, 'cause I'm getting old). The quilt started as a Chinese coin quilt made from a charm pack but after I'd gone through and pulled the matching 5" squares that I had in my stash I ended up with a lot of quilt, much more than I needed. 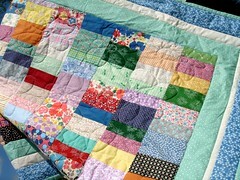 In fact, after I was done sewing the charm squares I cut the quilt in half. I should get the second one finished in the next few days. 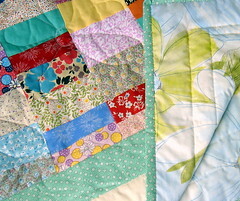 The quilts are extremely similar, the only differences being one of the border fabrics and the backing fabric. 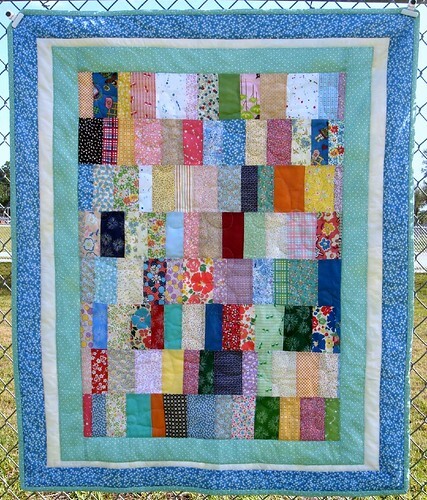 The quilting on this is done with very random imperfect flowers. I'm debating adding some hearts to it but am leaning towards leaving it as it. Around the borders the stitching is done in the ditch. I'd like to do some more stitching on the green floral and will probably add some kind of swirly pattern. The backing fabric is a recycled sheet. C. took the pictures while K. held the quilt and played. Oh, the bloglines thing ... thank you! I signed up for bloglines last night and added all my blogs. I've still got a few things to figure out but I can't believe I went without it for so long. What a difference it makes! So thank you, thank you. So pretty...the borders are the perfect frame! 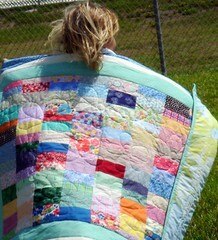 You're such a great quilter! This one is lovely as usual! 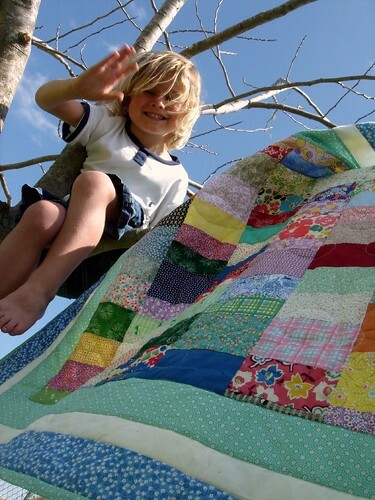 Beautiful quilt and beautiful pictures! I love that last one. C (your daughter?) seems to have a very creative talent for taking photos. Is she enrolled in a class of any sort?